Martingale has just published the book Minick and Simpson Blue & White - Living with Textiles You Love by Polly Minick and Laurie Simpson. 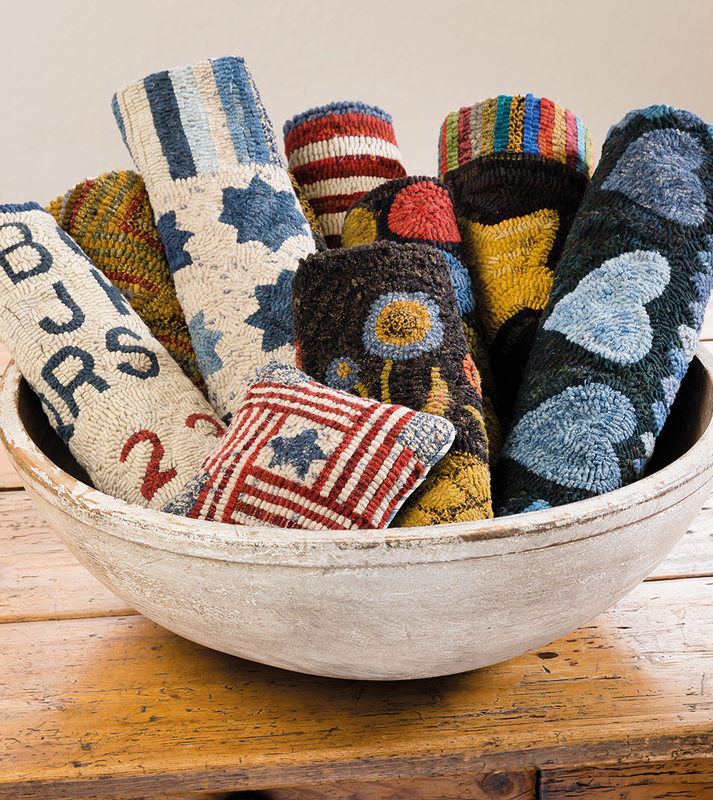 This gorgeous collection of quilts and rugs by sisters Polly and Laurie depicts quilts in their more contemporary function - house decor accessories. 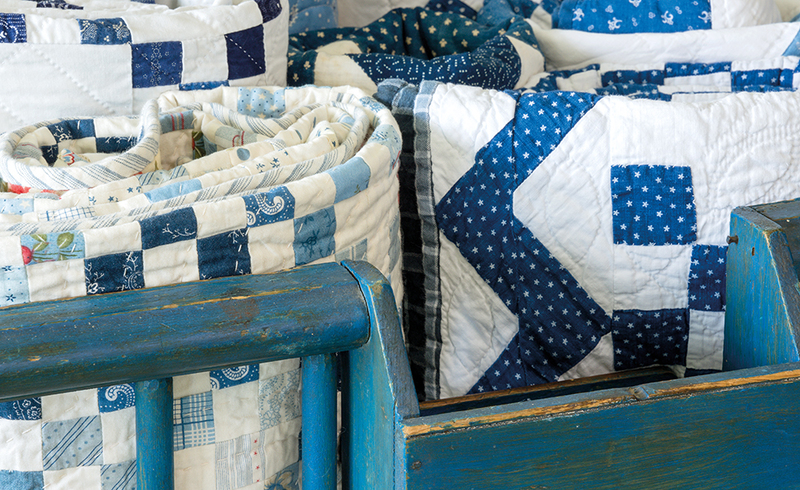 To be sure, quilts are still made to provide warmth and comfort to family and friends. Yet, their artistic value is celebrated as we display them in our homes and places of business. Blue & White is at once inspiring and educational: as your eyes feast on both quilt and rug projects your brain engages in design mode, your fingers itch to sew, and you mentally go through your stash wondering if you have all the fabric, or wool, you may need. Then, you walk around the house discovering new places and ways to display your work as creatively as you learned in their book. I often hang quilts over the railings inside the house. 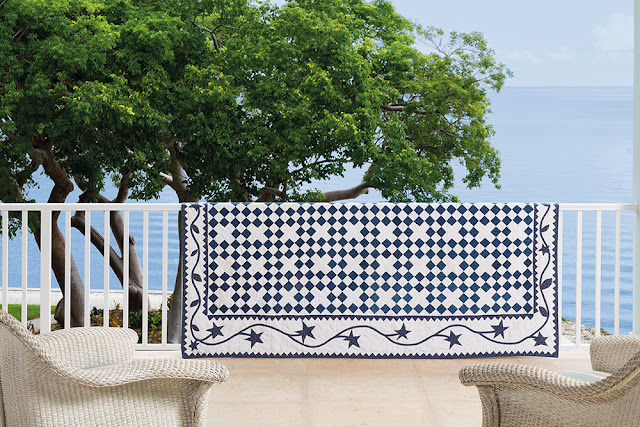 Outdoor railings are a great option, too, particularly when we have company over, provided we are mindful of the sun and changes in the weather. What a perfect corner and beautiful quilt! I love Laurie Simpson's choice of fabrics, keeping the more muted colors on the background as the dark blue emphasizes the Irish Chain design. 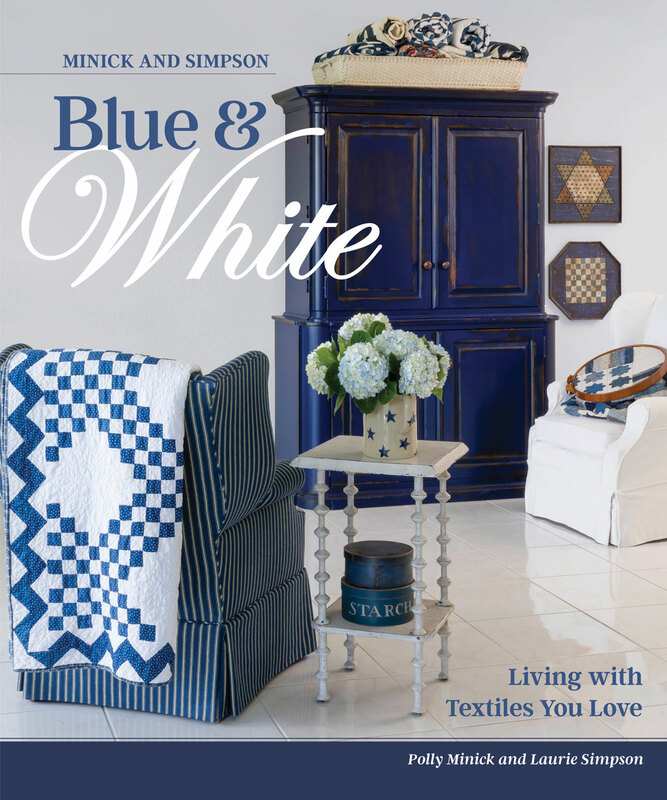 Although no patterns are provided, the sisters give us valuable advice on fabric and wool selection, as well as home accessory purchase and placement to achieve the best decorative results. 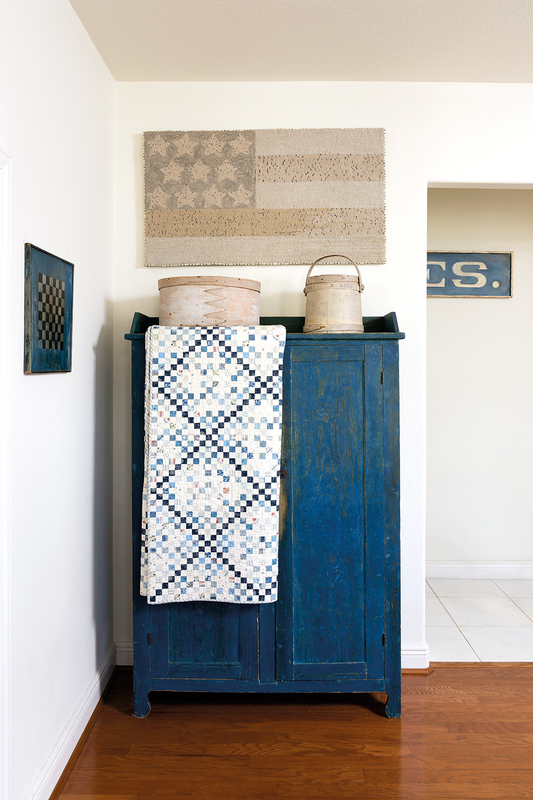 Baskets, open armoires, and antique furnishings are ideal for showcasing rolled up quilts and rugs, with bits of fabric and wool, and quilting textures, making us wonder what beauty they are hiding in their folds. Polly Minick's wool rugs have awaken in me a long-held desire to experiment with that craft (let's hope my husband does not read this post!). This is a perfect coffee table book. I doubt it will collect any dust as people will be drawn to its colors and photography. As Mother's Day is soon approaching, Blue & White would make a great gift. I am so glad I already have my own! Thank you and Polly for sharing your love of quilts and wool rugs with us! This is fabulous.I love this fabric combo.I hope to make a quilt only in two color and this is a fantastic pattern to try it.